My name is Jyotika and I am certified Employee Central consultant. We have read birthday mailer via Integration. Recently, we got a chance to play around in Employee Central, which was possible with guidance from experts Prasanna and Dhruv. 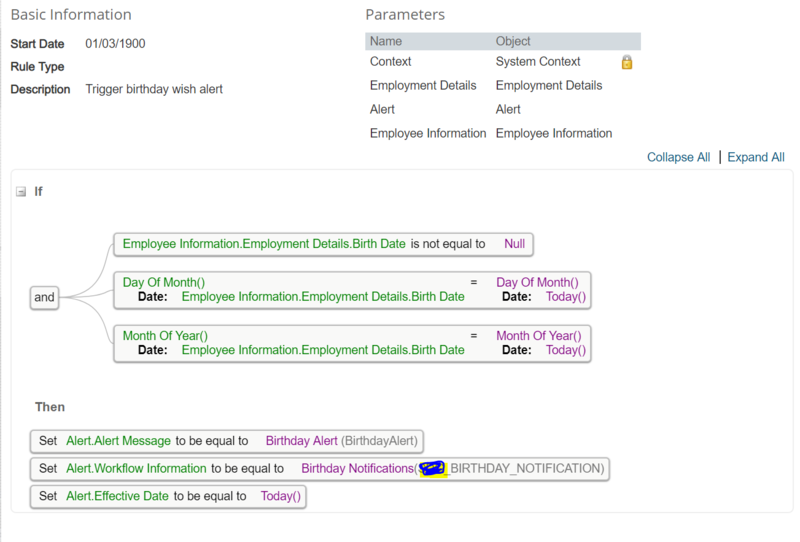 Create a rule for fetching date from Biographical Information to Employment Details. Create a rule for mail trigger on birth date. Navigate to Admin Center–> Manage Business Configuration. In employmentinfo section, create a custom-date field labelled as ‘Birth Date’ and click on Save. Navigate to RBP to give applicable permissions. Please note that Year of Birth is set to ‘Today’ as when the date is <date_of_birth><month_of_birth><year-today-eg- 2018> then mail will be triggered. To create a rule, we first create the message which would be triggered and also the stackholder(s) to whom this mail shall be triggered. For message, navigate to Manage Data–>Create New–>AlertMessage. For workflow, navigate to Manage organization,pay and job structures. This mail may trigger to self(employee), manager or HR team. Mention the stackholders accordingly in CC role ONLY. when the date and month of birthday is as on ‘Today’ , the mail triggers. As part of Year End Activity, Employment Details shall be imported with custom Birth date as <Date of Birth>/<Month of Birth>/<Next Year>. For example, 02/09/2019- to be updated as on Dec 2018 year end activities. With this, as system gets date of birth, month of birth and present year as today’s date, email would trigger without integration! I was trying to implement the same solution but, business rule just does not trigger. Can I ask how successful you were in applying this solution. Please make sure that the rule is on custom field which has present year. once Alerts and notifications job run is successful, mail is triggered. I have few questions if you do not mind me asking. As, the first rule suggests capturing DOB from Biographical Information portlet to Employee Details then, why do we have a manual Year End Activity? Because, second rule should simply take captured DOB in custom field and trigger an alert. If we are manually adding the Birth Date anyway via the import then, only second rule should be enough to trigger an alert, Right?. Also, how how does it maintains New Hire? the rule which triggers date and month of birthday, with current year, triggers at the time of hiring. as ‘no trigger’ is possible in subsequent years, manual upload with current year is required. this upload is to be done for employees who joined last year and before. if you could suggest a workaround, would be a great learning!